Genuine Leather “Tough Cookie II” Strong Pet Palace® Double Spiked Dog Collar SALE! (BLACK) PLUS FREE LED SAFETY FLASHING COLLAR TAG! SPECIAL OFFER: Every purchase currently comes with a free SAFETY LED flashing dog bone safety light so your pet can be seen in the dark. 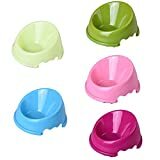 Easy to find if your dog runs off and can be clearly seen in traffic by motorists. The Tough Cookie dog collar by Pet Palace® is designed using a combination of genuine leather interior with a man made leather smooth finish for easy cleaning. 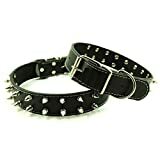 This strong dog collar comes with two rows of protective riveted metal spikes and buckle and D clasp for attaching leash. Can be worn by any dog with the above neck measurements. This collar offers some protection from bites in the neck area as well as being a fashionable collar for pets. It is strong and sturdy and will last in all weathers. The combination of genuine leather and man made leather offers greater protection from decay as well as easier maintenance. These collars will last years of heavy wear and tear. Will fit most dogs within the following breeds: Afghan Hound, Airedale Terrier, Akita, Alaskan Malamute, Basset Hound, Boxer, Bulldog, Bull Terrier, Chow, Collie, Doberman Pinscher, English Setter, German Shepherd, German Shorthaired, Golden Retriever, Irish Setter, Keeshond, Labrador Retriever, Norwegian Elkhound, Old English Sheepdog, Pointer, Siberian Husky, Weimaraner, Wheaten Terrier. Is especially suited to tough dogs, hence the name “Tough Cookie”, such as Staffordshire Pitbull Terriers, American Pitbulls, Mastiffs, Rottweilers, Dobermans, Boxers, Bulldogs, etc Please measure your pet before purchasing to ensure it’s a good neck fit. You should always allow an extra inch or so for comfort when fitting a collar. It can be use indoor or outdoor. The measurement allowed error is 1-3cm.